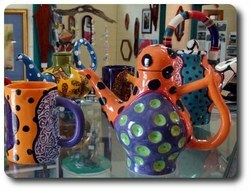 Located at the Old Cooktown Railway Station in Charlotte Street (opposite the West Coast Hotel) the Cooktown Creative Arts Association is a show case for local artists and craft people. In late 1990 and early 1991, a group of 15 local artists and craftspeople saw the need for an association which would cater for a wider range of art and craft based activities. Today the CCAA has members which have their art / craft for sale in the shop, providing local artists with a source of income, as well as a wonderful venue to showcase their talents. There are displays of wood work, furniture, paintings, jewellery, stained glass, quilts, can baskets, silk paintings, T-shirts, post cards, etched glasses and photography. The association also offers a range of workshops and demonstrations throughout the year.